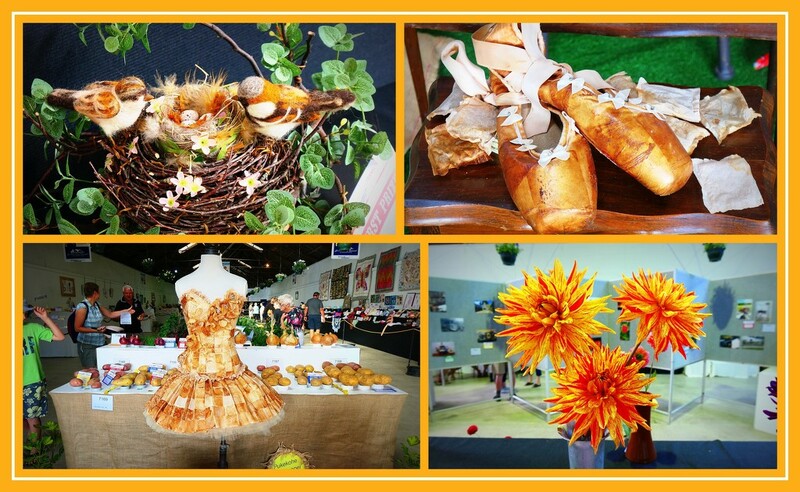 This weekend is the annual A&P Show ( Agriculture & Pastural) it has been going for 133 years. It has changed over the years so as to attract more of the 'Town folk'.. But the craft, baking and growing section is still well supported.. There are some very clever people around ... Top left are felted sparrows.. I had to have a second look as they look so real.. top right and lower left are a trash to treasure comp ... can you tell me what you think the shoes and dress are made of... and the stunning dahlia won the 3 bloom comp..
We spent some time watching the chopping comp where @dide 's son was competing ... I am sure she will have a few shots of this..
Are they used tea bags? A great collage with very interesting shots. Sounds like a real fun day for all. A lovely collage. It looks like a wonderful show. Great collage. You are right, the birds do look real.